Chatloop Vue Js Landing Page – This is App Landing Template. It is designed with Bootstrap 4.1.1 and clean & modern Look. 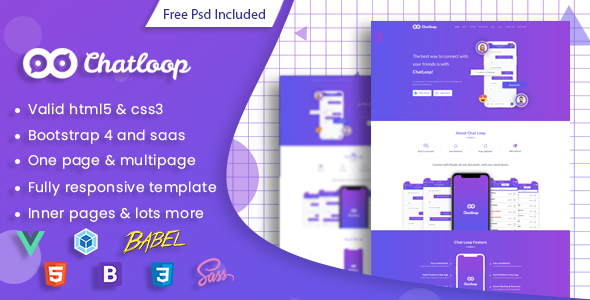 Chatloop is a very good VueTemplate, which suites best for any kind of App landing page. Chatloop looks beautiful at any size, be it a laptop screen, iPad, iPhone, Android Mobile or tablets. It has purpose oriented design, responsive layout and special features. Chatloop is Well organized and very easy to customize. It has everything you need to launch your site within next few hours!